Home » Laser Dentistry • Periodontology » What is Frenectomy and why is it needed? Frenectomy is a surgical procedure performed in the Dental clinic mostly for children and sometimes for adults as well depending on the need which can be preventive or as a part of the treatment procedure. 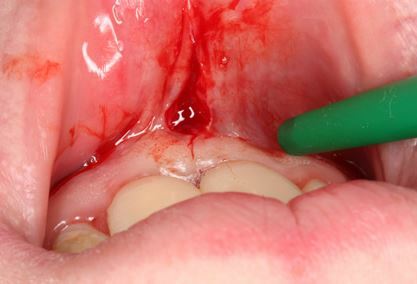 To put it in simple terms Frenectomy – Cutting or trimming of the Frenum. Let us first learn about Frenum before we go into the details about the procedure. Oral cavity usually contains two types of Frenum – Labial Frenum and Lingual Frenum and Frenectomy is performed when the frenal attachment is high, with the Labial Frenum of the maxilla (upper jaw) or mandible (lower jaw) leads to spacing between the central incisors. And with a high frenal attachment of the Lingual Frenum the tongue movements are restricted leading to difficulty in speech and difficulty in swallowing in extreme cases. Let us discuss both the Frenal attachments and how they affect when the Frenal attachments are high and what and when is the frenectomy required along with the Frenectomy procedure explained. Labial Frenum is the attachment of muscles from the upper lip to the Gingiva between the central incisors for the upper jaw and the lower lip to the Gingiva between the central incisors in the lower jaw. 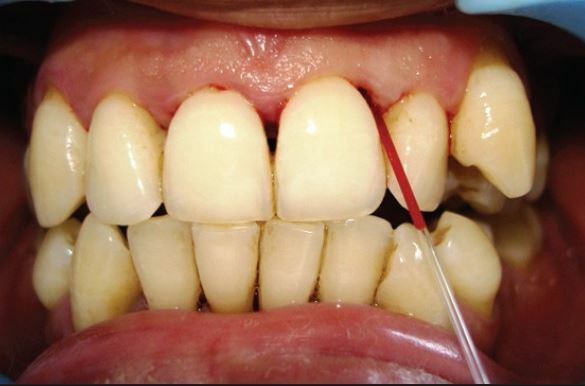 When the Frenal attachment is normal there is nothing to worry about and it will not be affecting the placement the teeth in any manner, but when there is high frenal attachment as seen in the picture below the pull of the muscles in the Frenum will lead to a gap between the central incisors. When is Labial Frenectomy (Maxillary or Mandibular) performed? This is one of the most common doubts which many patients get when the Dentist suggests this treatment for their children, teenagers or adults as well. In children the treatment is better avoided until the permanent teeth have erupted or if very prominent the Dentist will recommend Frenectomy to prevent gap between the upper or lower front teeth on eruption. If your child is going for Orthodontic treatment for gap between teeth, Frenectomy has to be performed before or during Orthodontic treatment to prevent the high frenal attachment to reopen the gap between the front teeth after closing it with Orthodontic treatment. Lingual frenum is the muscular attachment beneath the tongue, this holds the tongue to the floor of the mouth, everyone has Lingual frenum but when the Frenal attachment is high or extending till the tip of the tongue, the problem arises. It is called as Tongue tie which leads to difficulty in speaking or swallowing as it restricts the free movement of the tongue. Lingua Frenectomy has to be performed if the patient is being affected by it and there is no particular age for it. It is a pretty simple procedure, an incision is given with a scalpel or Dental Laser on the Lingual frenum after numbing the region with a local anesthetic agent and sutures are given to close the wound. What are the Techniques for Frenectomy? Conventional or Classical Frenectomy: It was introduced by Archer and Kruger in cases of frenal attachments leading to midline diatema. It is performed by following excision involving interdental tissues and palatine papilla along with the frenulum. Millers technique: It is introduced for post-orthodontic diastema cases and here the frenulum is excised and the labial alveolar bone in the midline is exposed, the incision is extended into the lip as required to remove the frenulum completely. V-Y plasty: It is used in cases involving broad frenal attachments seen in both incisor and premolar – molar region. Z plasty: Used in cases of hypertrophy of frenum with low insertion seen in inter-incisor diastema. Laser frenectomy: Use of a laser helps in reduced bleeding, no need of sutures and also the no need of local anesthesia. Dental Laser is the latest and the best option for Frenectomy as it immediately causes blood coagulation and almost no pain or bleeding will be present with laser treatment. Hope all doubts about Frenectomy have been cleared and if you are having any more doubts about Labial or Lingual Frenectomy do not hesitate to ask questions in the comments which I will try to answer to my best. Thanks for sharing with us keep posting good information ! !